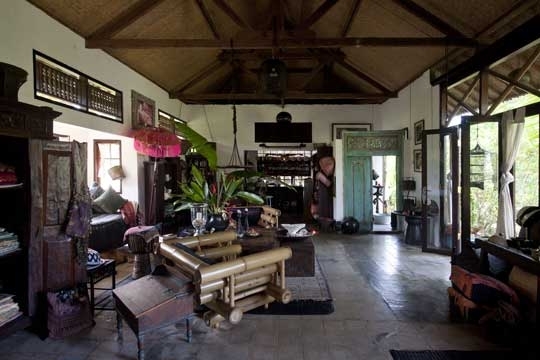 Lila Bamboo is a fascinating 3-bedroom villa of baronial proportions, built of river stone and bamboo—a peaceful retreat in a yoga ashram next to a quiet river and just a walk through the sacred Monkey Forest to the centre of Ubud with all its cultural, dining, and shopping opportunities. 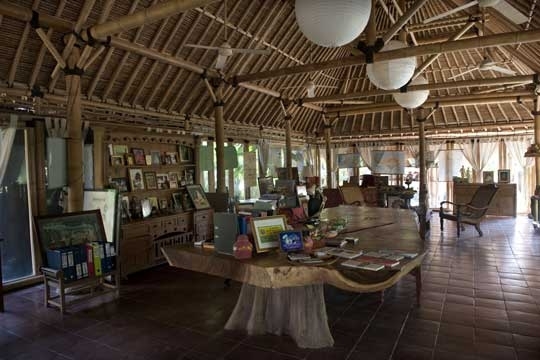 Villa Lila Bamboo is a place for people who want to experience the spiritual energy of Bali. 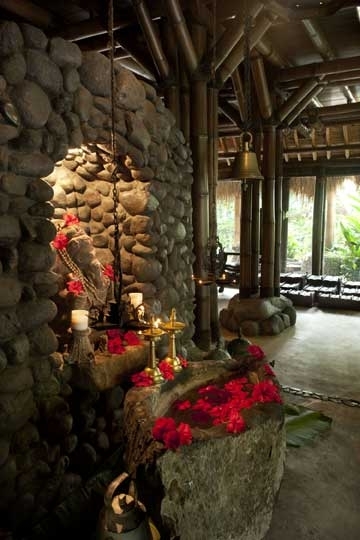 Hindu statues adorned with flowers give the villa a temple-like quality. The neighbourhood village of Nyuh Kuning is quiet, leafy, and pristine. 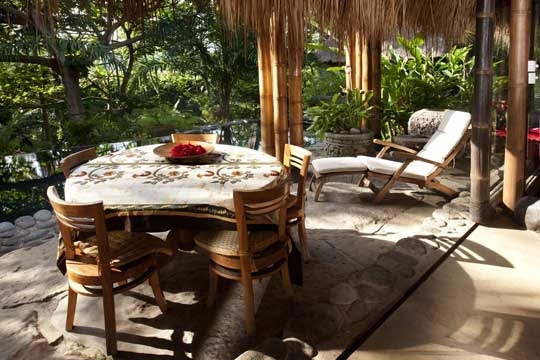 The large size of the house makes it ideal for a family or several couples. 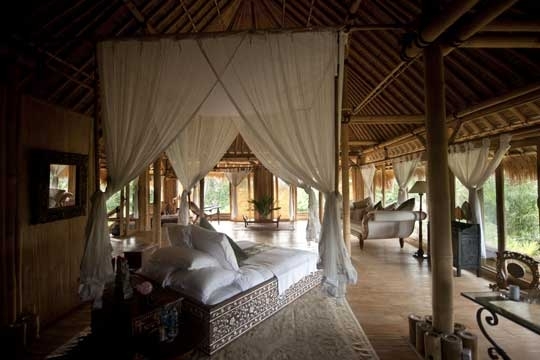 Although it is designed to sleep six, a small canopy bed in the second floor living room and a full bathroom on the ground floor make it easy to accommodate a seventh person. 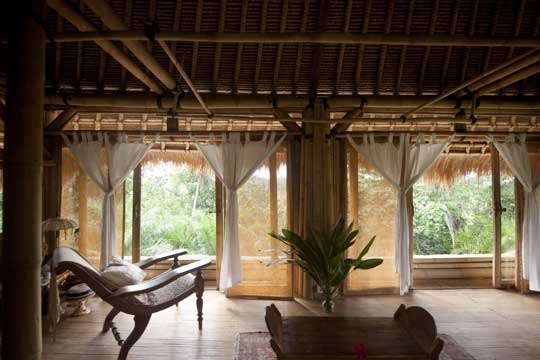 Life is simple and natural at Lila Bamboo. There is no television (although there is good WiFi internet throughout the grounds). 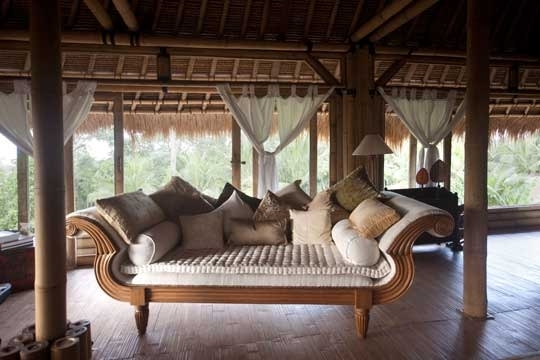 There is no air-conditioning, and no need for it since the design of the house allows fresh air to circulate freely. 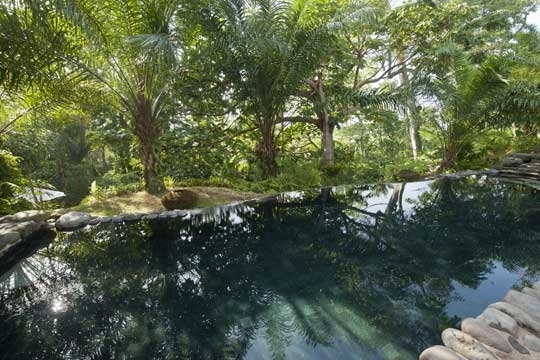 But neither is there a shortage of things to do: a stone-lined swimming pool runs along the east side of the house, while yoga classes, a traditional massage, raw food classes and excursions around the island can all be arranged on request. Airport pick-up and drop-off (one trip each) are complimentary, and a car and driver can be hired through the villa manager (at about USD30 per day, including petrol). 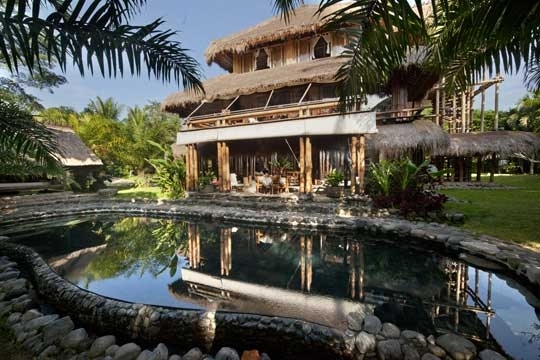 The villa has three full-time staff for housekeeping and looking after the pool and garden, and the live-in manager is very attentive to guests’ requirements. Breakfast is included in the rate while a cook is available to prepare lunch and dinner with a day’s notice; charges for this service (approximately US$5) plus food at cost are added to your account . 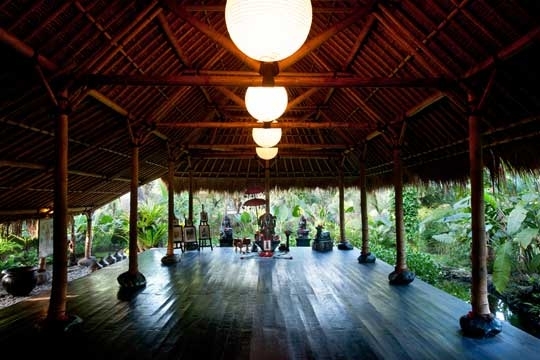 Alternatively, there are many good restaurants in nearby Ubud, and D’Waroeng, in Nyuh Kuning village, is an informal eating place with very good food; it has tables in the back garden, and they deliver too. 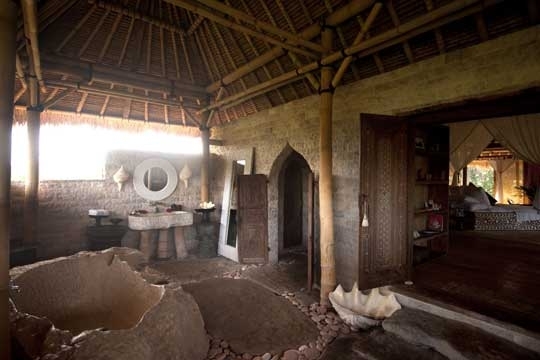 Lila Bamboo Villa was conceived to fund the Satyagraha Ashram for children, in whose one-hectare grounds the villa and its walled garden are situated. The children do not live there: they come for community-based yoga programs and schooling in organic gardening—very quiet activities. Smoking is strictly forbidden on the entire property, and no pets are allowed. 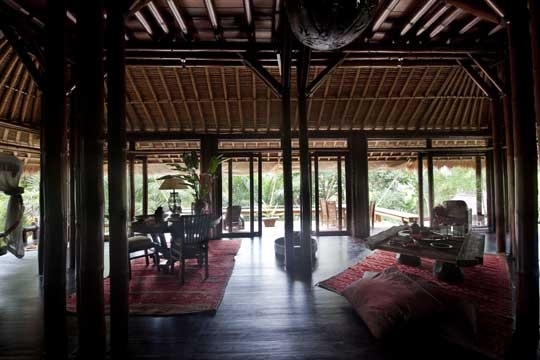 A stone and bamboo mansion in an ashram near central Ubud. 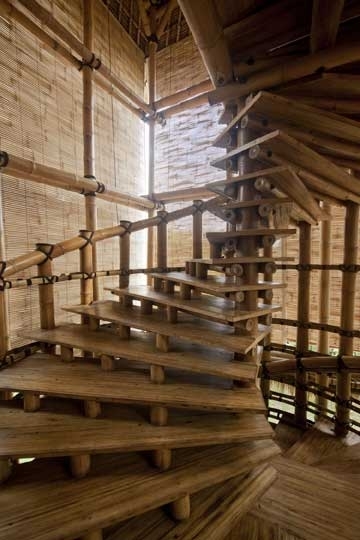 We loved the grand scale of Lila Bamboo, which allows the heart to open and take in the beauty of the place—and there is beauty everywhere, in the views, in the Asian art and antiques, and the construction details of the house itself, clearly built by hand. 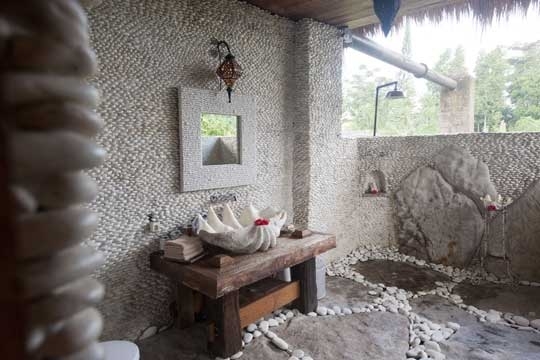 The natural materials and open-air ventilation create an atmosphere that is immediately relaxing and rejuvenating, and which seemed to grow deeper the longer we stayed. As we were travelling with two teenage children, we were at first concerned that they would not have enough to entertain them, since there is no television; but they had brought their laptops (which functioned perfectly with the good WiFi connection everywhere); and immediately got into the spirit of the house. 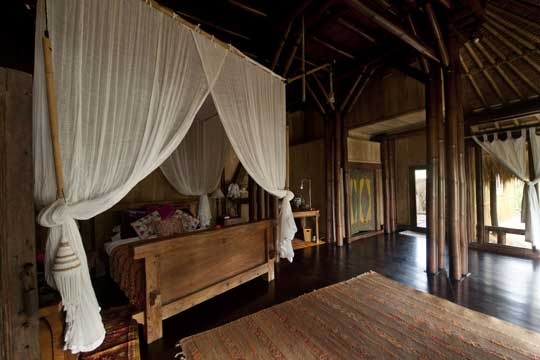 They loved their rooms, with their cabin-in-the-forest feel and huge bathrooms. We had lunch together in the large living room on their floor, which was also great for board games (we brought along our own). The children also spent a lot of time exploring the river and visiting the organic gardens of the ashram. They made friends with the cows and three Golden Retrievers. The swimming pool was a blessing for us all, so fresh at all hours of the day. The staff were gracious and competent. The house manager, Alfian, greeted us when we arrived and checked on us often. 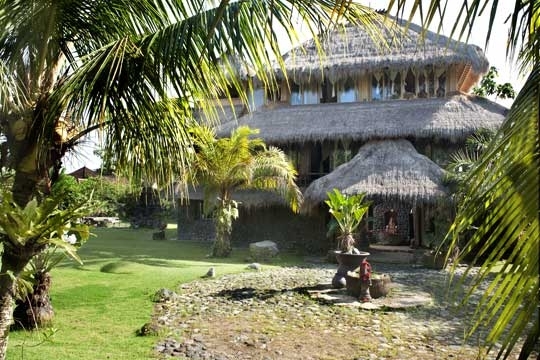 The two Balinese women looking after the house were a bit shy of speaking English, but they seemed to know exactly what we needed at any moment. On arrival we were immediately offered a glass of fresh coconut water—a most restorative drink full of nutrients. It came from coconut palms growing on the grounds, and a pitcher was always on hand, constantly refreshed. 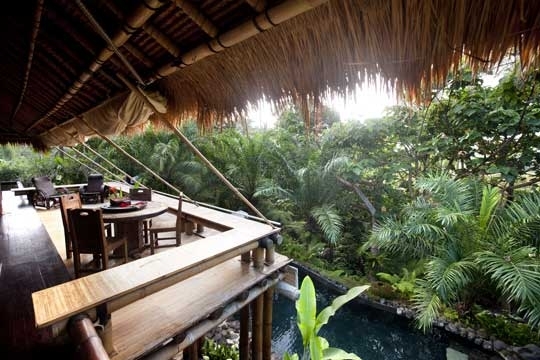 We had great meals during our stay—some in Ubud and some at the villa. Dinner at the massive dining table felt like being in a castle. 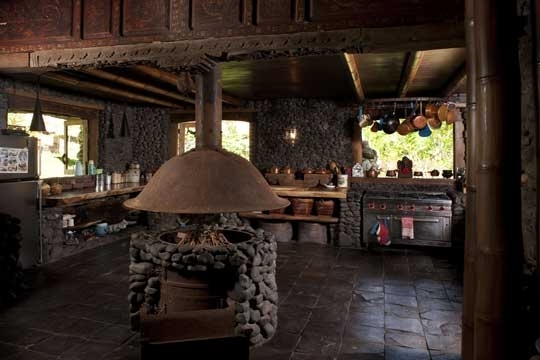 The freelance cook was brought in with a day’s notice, which meant that a bit of menu planning was necessary, but that will still be the case when a permanent cook is hired (in the plans), since staff need time to shop for fresh produce at the local market. 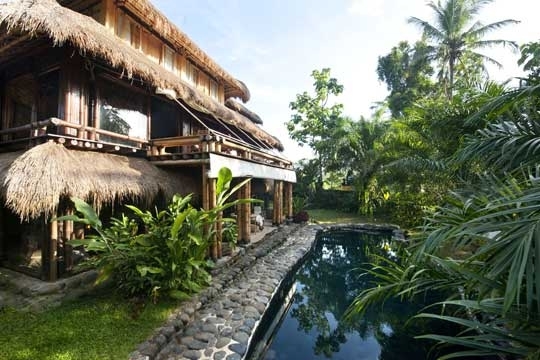 Lila Bamboo’s location in a pretty village within walking distance of Ubud offers a rare combination of seclusion and convenience. The large scale of this ingeniously built house is liberating and uplifting. The third floor bedroom, with its soft colours and beautiful textiles, has an ethereal quality; we will never forget the beauty of the moonlight streaming in on three sides. 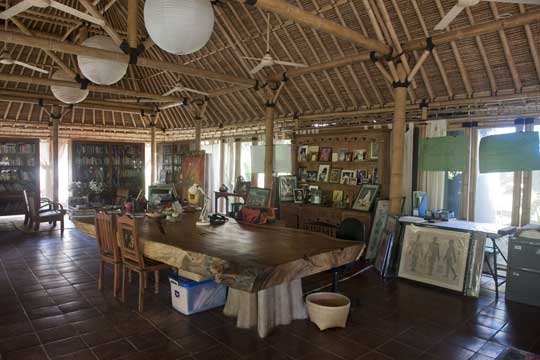 Lila Bamboo with its large walled garden is located in the grounds of the 1.13-hectare Satyagraha Ashram, in the northeast corner of the exceptionally neat and pretty village of Nyuh Kuning, which lies just south of Ubud’s sacred Monkey Forest. A short walk brings you to the famous Jalan Monkey Forest shopping street with uncountable shops and restaurants. Rice fields are still being cultivated just across the small river that flows by the east side of the villa. To the north, quiet villas and gardens are springing up. 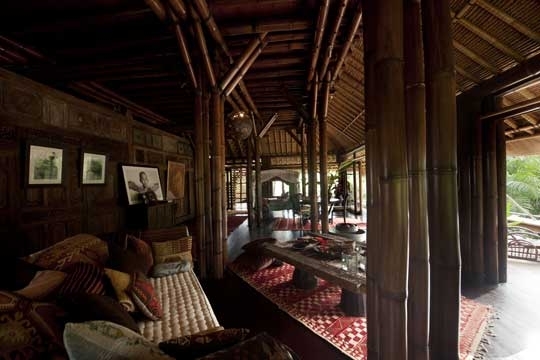 The villa’s tiered roof, which allows natural ventilation, rests on columns of giant bamboo poles lashed together and set on large rocks. Living and dining areas are on the ground floor. 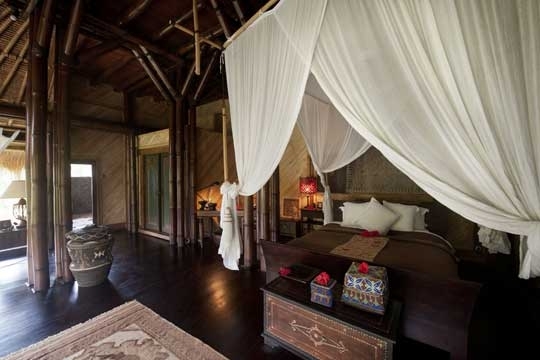 The three bedrooms—all with ensuite bathrooms, natural toiletries, walk-in closets, and canopied queen-size beds hung with mosquito netting—are on the second and third floors. 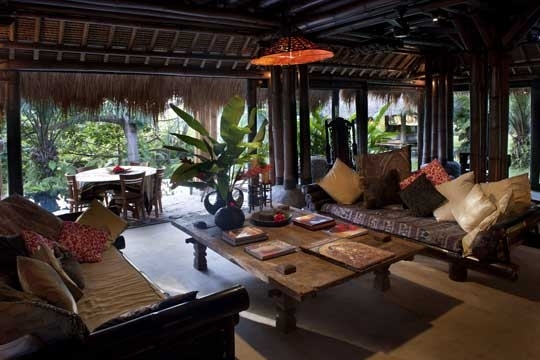 Asian carpets, antiques, and textiles create oriental sumptuousness amidst the organic materials of the house. 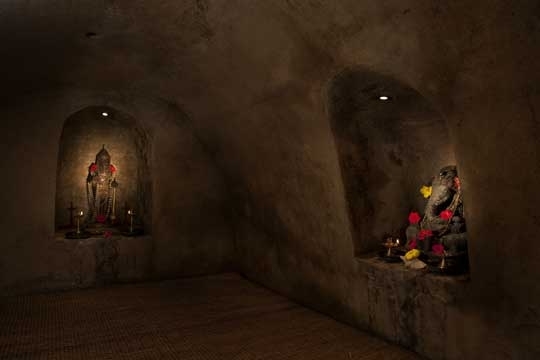 In the entrance foyer is a shrine to the elephant-headed god Ganesh set in a niche of river stones. 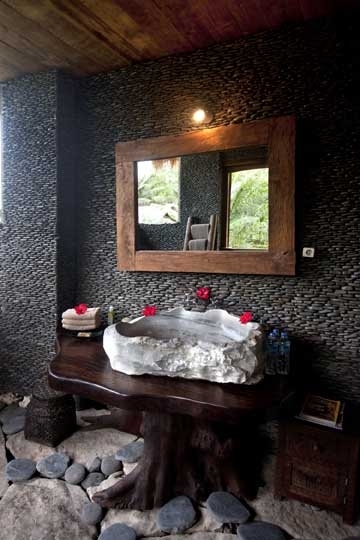 Black river stone walls give the ground floor a dark glamour (which some may find simply too dark, although light blasts in through sliding glass walls, and the ceilings are high). Floors are of suede-like adobe. 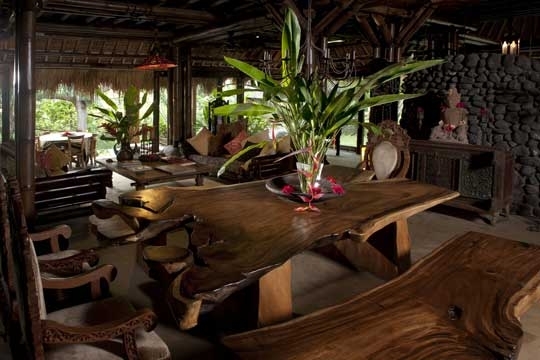 Sofas of giant black bamboo flank a recycled teak coffee table and the big timber dining table (seats up to twelve) has free-form benches and baroque armchairs. Also on the ground floor is a bathroom with shower, and the large professional kitchen. A patio with table and lounge chairs lets you enjoy the morning light by the stone-lined swimming pool stretching along the east side of the house. The second floor, up a beautiful, broad spiral staircase, has a large living area and long balcony. 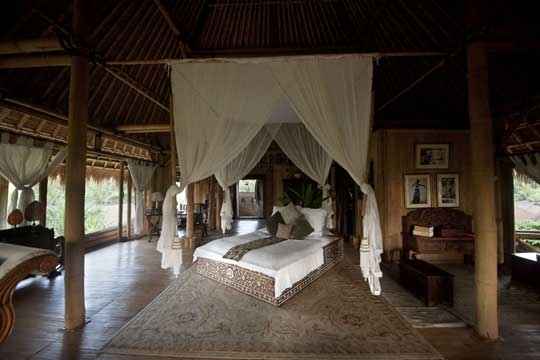 The honeyed mood of this room comes from the antique furniture, warm tea-colour bamboo, and thick red carpets. 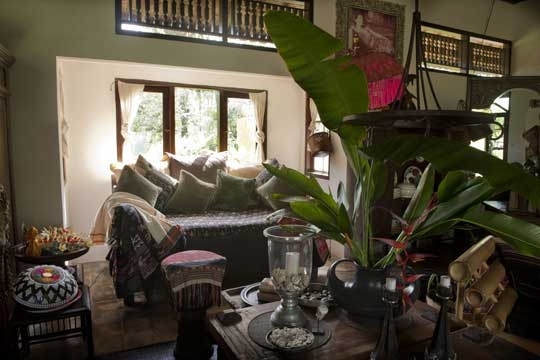 The two bedrooms on this floor have sliding glass walls overlooking the garden, study desks, big carpets, antique painted teak panels, and large bathrooms with rain showers. Alix’s room, as it is called, is masculine and trim; Sophie’s has furnishings in soft, pretty colours. 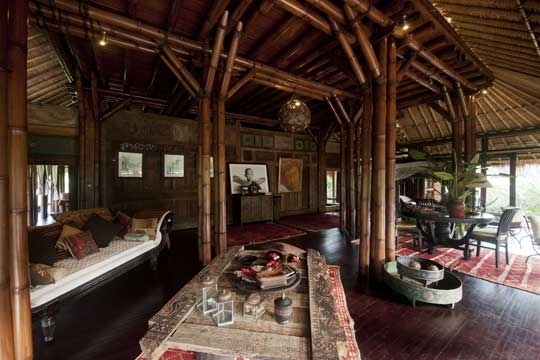 The third floor is one large light-filled room, with pale bamboo, sliding glass walls, a walk-in closet and large bathroom. The furnishings are white or pastels. The regally centred bed has a timber frame inlaid with mother-of-pearl. There is a large sofa, big glass-topped desk, antique dressing table, and several nooks for study or meditation are lined with precious-looking 19th-century books. 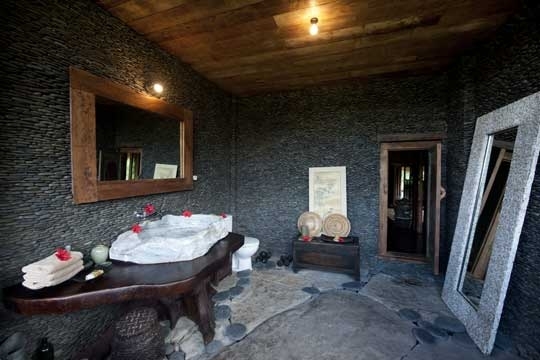 The bathroom has a rain shower and a big bathtub of carved pale stone; the WC is in a walk-in niche with shelves of art objects. An adobe wall encloses the villa’s broad lawns. There is a comfortable pool pavilion with cushions. 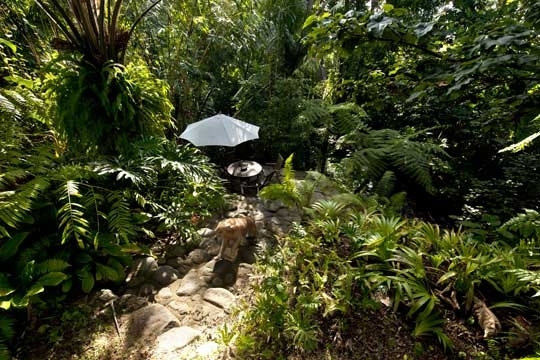 Two paths lead to a small river in a shady glade, with several places to sit and enjoy the air. 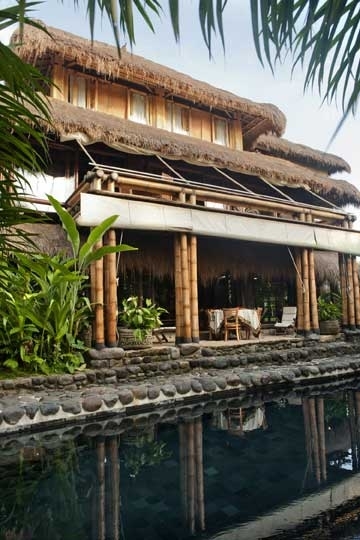 3 bedroom villa located in Ubud, Bali. 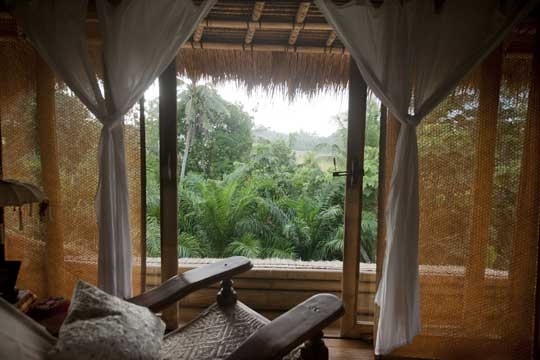 Ideal for Body and soul, Eco aware, Romantic retreats, Room with a view, Walk into town. 7 out of 10 based on 1 user reviews.